Michael Rotondo Alex Jones $3K donation. Pictured the millennial deadbeat son with the Infowars host. 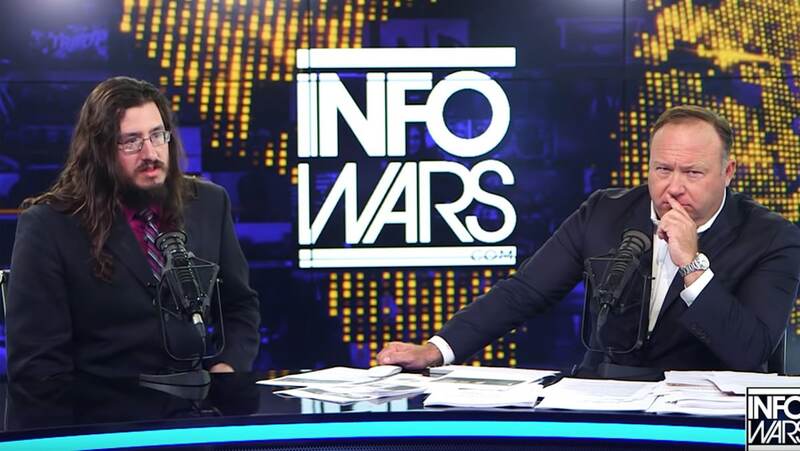 Michael Rotondo Alex Jones $3K donation: The millennial deadbeat son forced to vacate his parent’s home by June 1 appears on the Infowars show to discuss life and what he plans to do with the host’s $3000 check. Also joining the fray is Infowars honcho, Alex Jones who over the weekend it was announced had donated $3000 to the deadbeat millennial son being sued by his parents to vacate their Camilus, NY home. The ‘donation’ follows Michael Rotondo, a self affirmed conservative on Friday appearing on Jones’ (way) right of center Infowars show where he discussed his precarious dynamics. The interview took place following the show (aka Alex Jones’ bank vaults) flying the soon to be homeless man to Texas to appear on the Infowars show. Jones (no stranger to his own ever revolving sphere of controversy) involvement in Rotondo’s brewing fiasco comes off the heels of a judge last week giving the millennial until June 1 to move out of his parent’s home or face physical eviction by court appointed Marshalls. Not necessarily clear is whether the handout was an agreed ‘appearance’ fee that or simply a gift by Jones. A gift that will presumably be paid back and then some by the added publicity and traffic swelling to the Infowars website. Of note, the cash handout follows an adult entertainment company allegedly offering Rotondo a gig with their outlet. It wasn’t clear what ‘the gig’ would entail and whether Rotondo would take up the offer. Michael Rotondo Alex Jones Infowars host interview: ‘You appear to be sane and capable’. 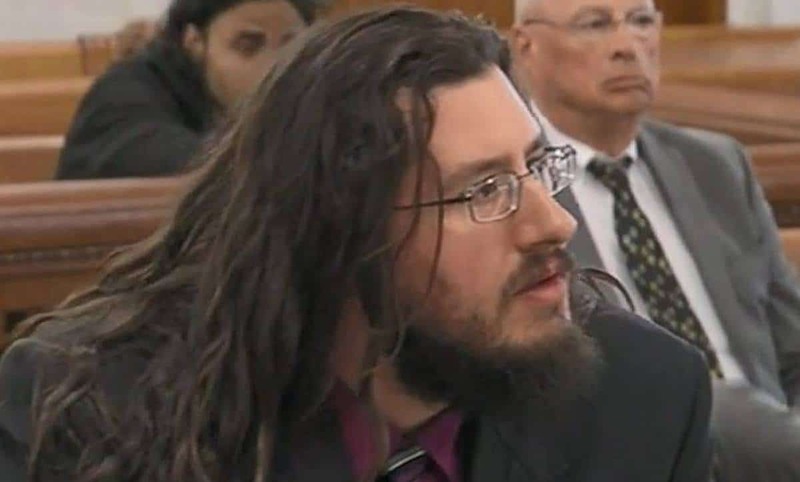 ‘I want to get out of my parents’ house’ Rotondo responded. ‘Which you made possible,’ referring to the check given off camera. Where Rotondo plans now to move and the terms of his new ‘dwelling’ arrangement wasn’t immediately clear. The cash gift comes days after Rotondo expressed his disappointment after a judge sided with his parents, Christina and Mark Rotondo, saying that after having lived with his parents for the last eight years, rent free, it was finally time to go, especially after Rotondo repeatedly turning down his parent’s pleas in recent months to get out. Micheal Rotondo: Quintessential millennial deadbeat? During an interview with TMZ (notice a pattern here kids?) Rotondo told the celebrity gossip rag that his parents were ‘not good people,’ for forcing him to vacate their Camillus home. ‘I just think that when you attack someone you love … I don’t think good people do that,’ he said. The father-of-one also told the outlet that coming back to his folks’ house after their hearing was ‘the same’. ‘We didn’t talk before, we don’t talk now. It’s not much different,’ he said, adding that they ‘don’t really’ have a relationship. Rotondo told TMZ that once he does leave there will be no relationship at all with parents. Of note, as Rotondo was leaving Jones’s studios on Friday he promised the Infowars host not to cash in his money and get a ‘nose job like most liberals’. A request that Rotondo repeatedly assured Jones he would not be doing as he declined the host’s offer to stay overnight before returning that Friday to continue packing his boxes…. ‘I’m too busy to get a job’ Deadbeat millennial insists he has right to mooch off parents.